Shorts and I had a pretty good run this year. I wore them with blazers, with long sleeves, with graphic tees, and with boots. But I think it may be time to pack them up until next year, because, well, last weekend, I had to put on a winter coat. Don't worry shorts, we will definitely meet again. Have you packed in all of your summer clothes yet, or are you trying to sneak in a few more wears? 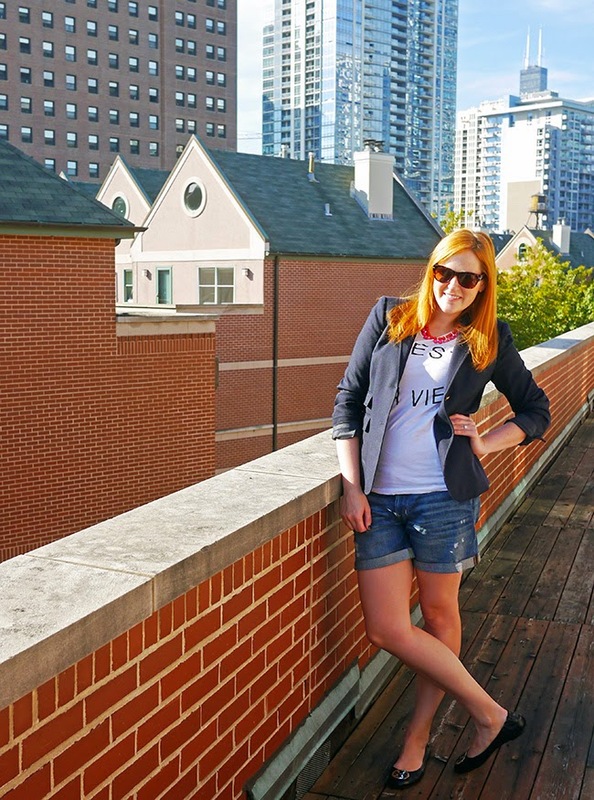 Linking up with Style Me Wednesday and Life & Style. So cute! 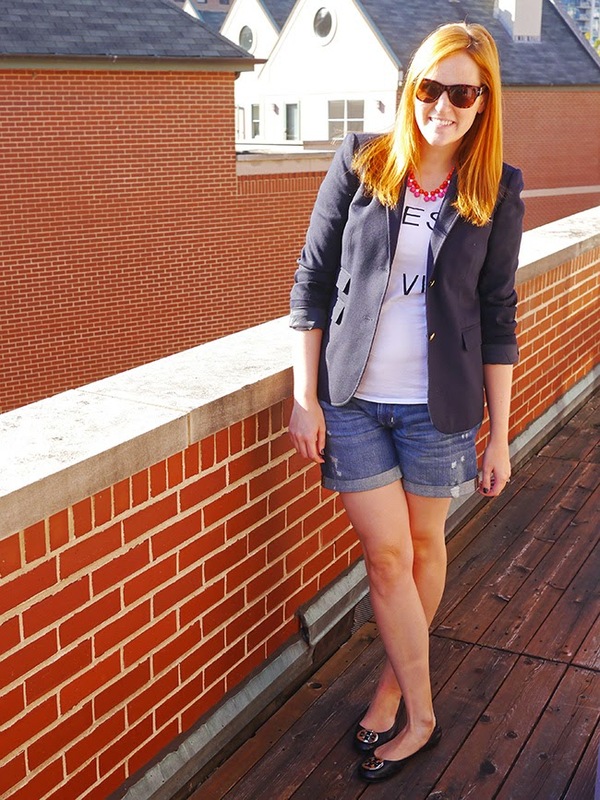 I love blazers and shorts - they're the cutest unexpected combo. And I love the tee with the necklace too. Very cute! Hope you're doing well lovely! I love this look so much! I think blazers and shorts are that perfect mix of casual and chic. I put mine away a few weeks ago, but I'm pretty sure it's colder here in Toronto. I do miss my shorts already though....but sweaters are fun too! love how you made those shorts more seasonally appropriate with the blazer, kind of schoolgirl casual chic all rolled into one! so glad that lyndsay featured you too in her tour, your blog is too cute! Cute!! Those Tory Burch flats are awesome! Just stumbled upon your blog from a link up - first of all, the title of your blog is great - I love it! Also, I love everything about your outfit - jean shorts, blazer and t-shirt. That is like my go-to outfit...all the time...ha! I love this outfit!!! 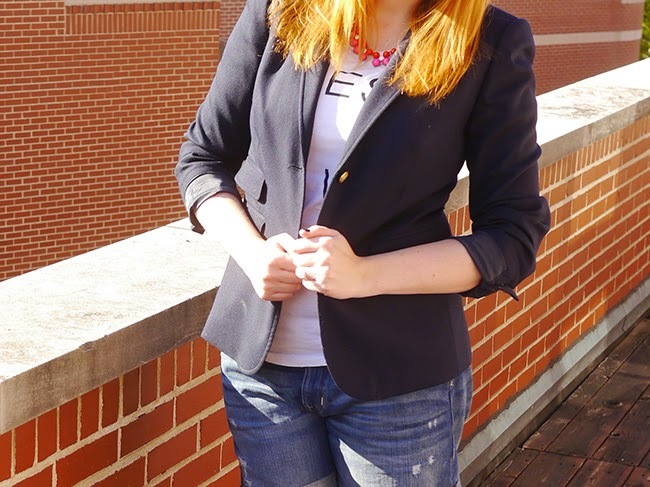 I would never think to wear a blazer with shorts but it looks so good!